Ukrainian pilot Nadia Savchenko undermined her health due to long hunger strikes, lawyer Mark Feygin said. "At present moment Nadia feels herself not so bad. However, she has a small stone, which she previously didn't have. She undermined her health due to the hunger strikes in prison. Now her strength is maintained with the organic mixtures, she doesn't eat solid food. 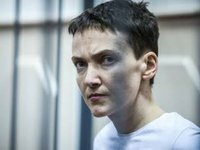 In case of her refusal to drink the mixture, she won't be brought to the court," he told Interfax on Monday. According to him, Savchenko buys organic mixtures for her own money.